The first part of the publication contains an analysis of the latest FDI trends. 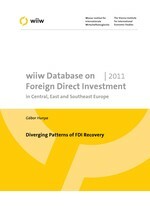 The analysis highlights the diverging patterns of FDI recovery in 2010. FDI continues to be of great significance for the development of CEECs, in particular of the new EU members. The domestic engines of economic growth are still weak, and fiscal consolidation drags on the economies. Recovery started mainly based on external demand which has upgraded the importance of foreign investors that generate the major part of exports. The first part of the publication, following detailed methodological explanations of FDI related terminology, provides an analysis of the latest FDI trends. Modest and uneven recovery characterized the development of FDI in CEECs in 2010 which recorded an increase of 9% (in current euro terms). The strongest growth occurred in Russia, the Czech Republic, Latvia and Lithuania. Bulgaria, Romania and Southeast Europe booked another year of severe decline. FDI was attracted mainly by three factors: domestic economic growth based on exports, improving financial stability reducing investment risk, and the recovery of the financial position of investors. All three factors coincided positively in the Czech Republic, while e.g. in Hungary investment risks were accumulated in the financial sector but new equity investments went into the export-oriented automotive industry. The number of new greenfield projects recovered strongly throughout the region but they promise less investment value than in the previous year. As for 2011, wiiw experts are more optimistic than global surveys and expect a 27% increase of FDI inflows to the CEECs. Most of the FDI growth will be allocated to Russia, much of it, as in the past, invested by Russian off-shore companies. The proximity to highly developed European countries with growing economies is expected to attract substantial FDI in the NMS (+10%) and the SEE (+29%). The second part of this publication contains two sets of tables: Tables in part I cover FDI flow and stock data, FDI flows by form and related income; Tables in part II provide detailed FDI data by economic activity and by country. The main sources of data are the central banks of the individual Central, East and Southeast European countries.